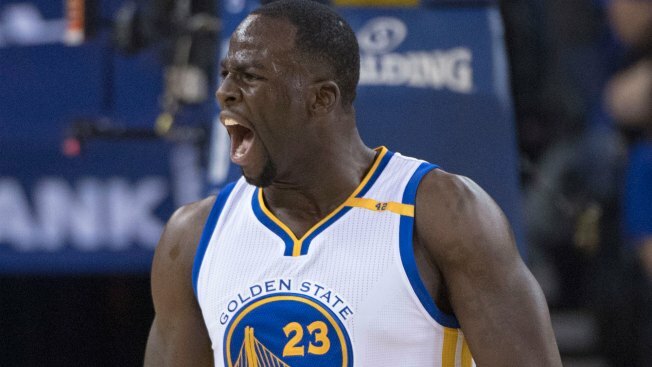 OAKLAND – Though Draymond Green played a tremendous game in the Warriors’ 132-127 double-overtime loss to Houston on Thursday night, it was evident afterward that he had issues with the officiating. In short, he neither liked it nor understood it. Green was whistled for a technical foul in the second quarter for protesting vociferously, and then whistled for a flagrant 1 in the second overtime. The flagrant 1, called by crew chief Bill Kennedy when Green kicked Rockets star James Harden in the face while both were airborne, struck a nerve. “The thought that they would call a flagrant foul never even crossed my mind,” said Green, whose superb performance – 20 points, 15 rebounds, nine assists and two steals – was not enough to avoid defeat. He didn’t stop there. He rather challenged the officials’ knowledge of the rulebook. “A lot of other calls led up to that one call . . . I really don’t care,” Green said. “(The officials) are going to do what they want to do regardless. It doesn’t make no difference one way or another. A flagrant 1 is defined as “unnecessary contact committed by a player against an opponent.” Officials review and make a determination. In this instance, the crew led by Bill Kennedy, determined that Green deserved a flagrant 1. Green’s point was that officials seemed to miss calls on the Rockets that would fit the description of a flagrant 1. Green, who fouled out with 8.4 seconds left in the second OT, wasn’t the only one who felt the officials, calling 55 personal fouls and five technical fouls, were less than stellar. The sellout crowd at Oracle Arena on several occasions showered them with boos and derisive chants. Asked if the officiating was uneven enough to cause confusion, he didn’t hesitate. “Yeah, it was,” he said before turning to sarcasm. Truth is, Green may have to get used to this. He has been a marked man ever since last postseason, when he got a bit too physical in the minds of the NBA, and there is no reason to think anything will change soon.